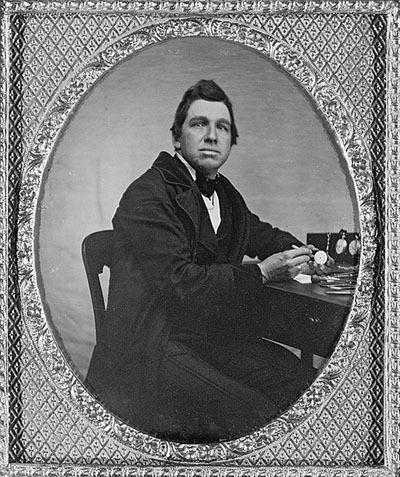 [ABOVE] A collodion positive portrait of an anonymous watchmaker, photographed around 1860. [ABOVE] A notice published in The Brighton Herald newspaper on 15th November 1856, announcing Thomas Boxell's removal from 145 North Street to 40 King's Road, Brighton. Thomas Boxell was born in Brighton in 1823, the son of Ann and John Boxell, an ostler of Rock Street, Brighton. Thomas Boxell, who was baptised "Thomas Boxall" at Brighton's St Nicholas' Church on 28th December 1823, generally spelt his surname as "Boxell" but his family name is often recorded as 'Boxall' in census returns and trade directories. Thomas Boxell had three younger brothers - Joseph Boxell (born 1830, Brighton), Frederick Boxell (born c1832, Brighton) and Nathan Boxell (born c1835, Brighton). 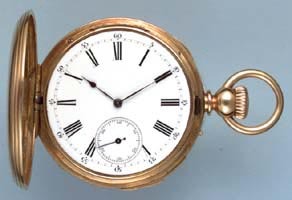 As a young man Thomas Boxell was apprenticed to a local watchmaker and by 1845, at the age of twenty-two, he was running his own business as a watchmaker and jeweller at 55/56 Albion Street, Brighton. In 1847, twenty-three year old Thomas Boxell married Barbara Brinkhurst (born 1821,Uckfield, Sussex), the daughter of Elizabeth Eades and John Brinkhurst. The couple set up home in a building in North Street Quadrant at the junction with Queen's Road, Brighton. The 1851 census records Thomas Boxell and his wife Barbara at No.1 North Street Quadrant (Queen's Road), Brighton. Thomas Boxell is described on the census return as a twenty-seven year old "Watch & Clockmaker - employing 4 men". Sharing Thomas Boxell's home were three of his younger brothers. Two of his siblings, twenty-one year old Joseph Boxell and nineteen year old Nathan Boxell are also entered on the census return as watch and clockmakers, so presumably were employed by their elder brother. The youngest brother, nineteen year old Nathan Boxell was working as a "Junior Clerk". At this time, Thomas Boxell was operating two shops in Brighton, one at 1 North Street Quadrant, the other at 149 (145) North Street. A book on the famous London clockmaker Thomas Cole (1800-1864) noted that Thomas Boxell "obviously catered for a wealthy and retired London clientele, purchasing the majority of his clocks from manufacturers in London and selling jewellery, silver and clocks." 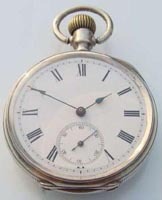 In 1856, Thomas Boxell re-located his clock and watch making business to 40 King's Road, Brighton. Melville & Co.'s Directory of Sussex, issued for the year 1858, gives Thomas Boxell's full business address as The Brighton Observatory, 40 King's Road, Brighton. The 1859 Post Office Directory of Sussex records Thomas Boxell as a "watchmaker & jeweller" at 43 King's Road, Brighton and he is listed as a watch maker at this address in local trade directories and other documents over the next 25 years. During the 2nd Quarter of 1859, Thomas Boxell married for a second time. Thomas's new bride was Elizabeth Watkins (born c1823, Chelsea, Middlesex). The couple were married for nearly 25 years, but there is no record of any offspring. No children are recorded from Thomas Boxell's first marriage to Barbara Brinkhurst either, so there are probably no direct descendants. However, Thomas Boxell's three younger brothers - Joseph Boxell, Frederick Boxell and Nathan Boxell - all married and produced a number of children. Thomas Boxell was recorded as a "watchmaker & jeweller" in Brighton as early as 1845. Kelly's Directory of Sussex published in 1846 lists Thomas Boxell as a "watchmaker" at 56 Albion Street, Brighton. The 1851 census records Thomas Boxell at No. 1 North Street Quadrant, Queen's Road, Brighton. The census return describes Thomas Boxell as a "Watch & Clock Maker - employing 4 men". That same year, Boxell opened a second shop in North Street, Brighton. Kelly's Post Office Directory of Sussex and Taylor's Original Brighton & Hove Directory lists Thomas Boxell at 145 North Street, Brighton, in their lists headed 'Watch & Clockmakers'. Advertisements published in the Brighton Herald in November 1856 announced Thomas Boxell's removal to 40 King's Road, Brighton. When the census was taken some 25 years later on 3rd April 1881, Thomas Boxell was recorded as a Master Watchmaker "employing 11 hands" at 43 King's Road, Brighton. 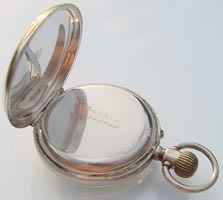 [RIGHT] The name "BOXELL - BRIGHTON" inscribed on the case of a silver pocket watch. [ABOVE] The face of a silver pocket watch. Thomas Boxell's trade mark is shown above. 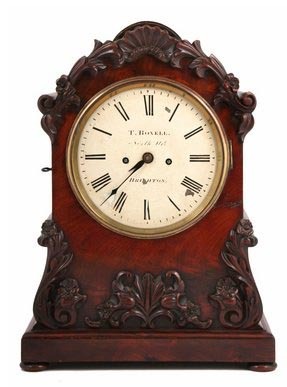 [ABOVE] A nineteenth century mahogany mantle clock with the name "T. BOXELL - BRiGHTON" printed on the clock face. When the census of Brighton was carried out on 3rd April 1881, Thomas Boxell and his second wife Elizabeth were recorded at 43 King's Road, Brighton. Thomas Boxell was still in charge of a successful clock and watch making business. On the census return, fifty-eight year old Thomas Boxell is described as a "Watchmaker (Master) employing 11 hands."